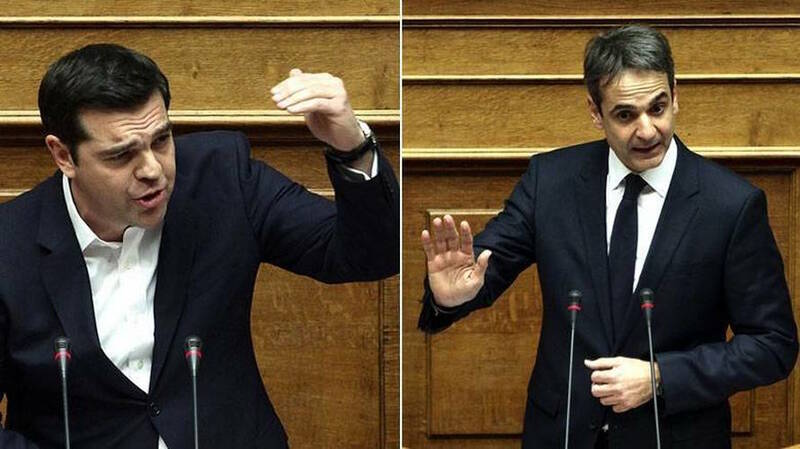 New Democracy chief Kyriakos Mitsotakis and Alexis Tsipras exchanged accusations over crime, bailout program and Grexit in Greek Parliament on Friday during the “Hour of the prime minister” session. The opposition leader talked about a rise in crime rates and particularly about the rampant activities of anarchist groups that burn buses and destroy public transportation ticket validation machines. He also spoke of the Exarchia neighborhood that described it as a criminality ghetto. The prime minister replied that the crime issue is not topical and that Mitsotakis is only trying to create impressions. He said that according to police figures criminal rates are mostly down during the Syriza administration and in the worst case they are the same as during previous administrations, adding that mass media blow the crime issue out of proportion. Mitsotakis said that on the issue of the bailout program review, Tsipras is two-faced because he tells creditors one thing and Greek citizens another. He blamed the administration for delaying negotiations, burdening Greek people with billions of euros of additional debt and costing the economy much more. Mitsotakis also asked from Tsipras to take a clear stance on Greece’s position in the euro zone, as several of his ministers and MPs have hinted on a return to the drachma, thereby generating market uncertainty and driving potential investors away. He used as examples the rising spreads of Greek bonds and the bank run of 2.5 billion euros since January 1. He also said that lately all government-friendly newspapers propagandize in favor of a national currency.